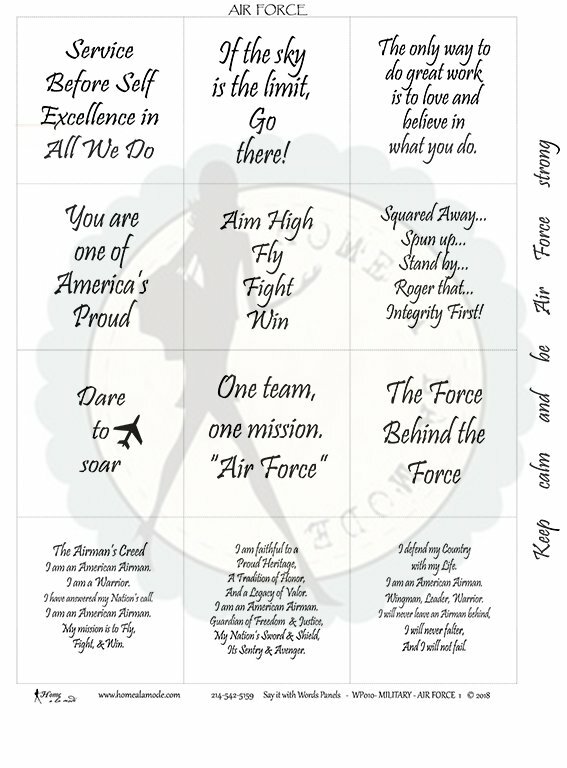 Say it with words, MILITARY - AIR FORCE is a Home a la mode word panel that is all about the serious side of our feelings and the fun learned rules for our Air Force Family and Friends... like: Service Before Self Excellence in All We Do - If the sky is the limit, Go there! - The only way to do great work is to love and believe in what you do. - You are one of America's Proud. - Aim High Fly Fight Win - Squared Away...Spun up...Stand by...Roger that...Integrity First! - Dare to soar - One team, one mission. "Air Force" - The Force Behind the Force - Go the extra mile... Thank you for your service! - I pledge allegiance to the Flag of the United States of America and to the Republic for which it stands, one nation, under God, indivisible, with liberty and justice for all. This panel is Copyright processed and No copies can be made. Company logo is only a watermark and not on printed panels. Printing done in Texas on Moda Bella 100% cotton. Create your quilt OR project to inspire someone special…”It’s a card in a quilt”.